…and always on the lookout for travel tools like Travelindicator. Travelindicator is a search tool for coming up with travel ideas that takes an interactive and data-driven approach to helping you find places to visit. I love guidebooks and travel writing, but they do tend to talk at you with information. Travelindicator talks with you, and learns the language you speak, so that you find perfect destinations. You enter in a few preferences such as how far you’re willing to travel, what sort of temperature you have in mind, and the kind of trip you’re looking to take, and Travelindicator generates a number of possibilities quickly. Overall, you have 23 different themes (e.g. beaches and seaside, adventure, nature and wildlife, urban, eating and going out, paradise…) that you can mix and match in order to peruse ideas for different styles of vacationing. 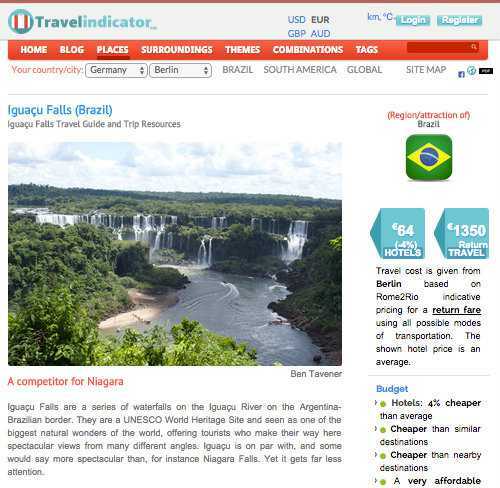 Instead of exhaustive details about each place, Travelindicator provides a quick review. These short descriptions include key features, forecast, the distance from your point of departure, average hotel prices and estimated airfare. Food for thought. This is your chance to discover new options and whet your appetite for making reservations. (Careful though, it probably won’t take long to grow a must-visit list). 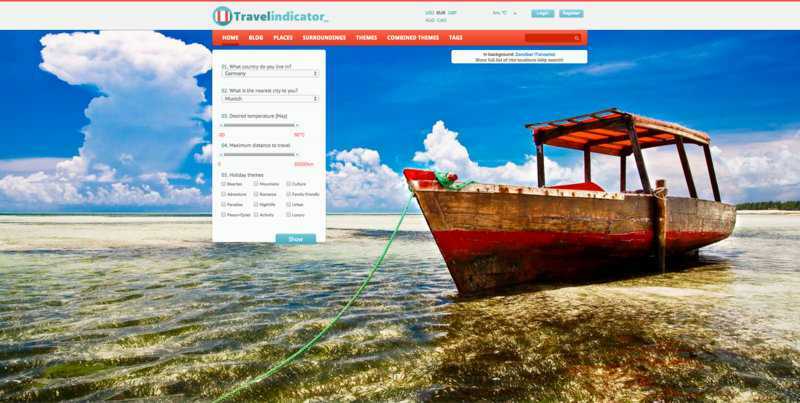 Travelindicator also works as a social platform connecting travelers. Individuals can either store their itineraries or share them with others, as well as chat with each other. Is there anything more fun than discussing travel? Unlike your average profile, Travelindicator also uses your stored destinations to chart what kind of traveler you are – family man, thrill seeker, etc. This information can then be used to adjust searches and find even more destinations suited to your travel interests. Another appealing feature of the website is that it tracks current cheap hotel prices (and expensive, if luxury’s your game), so you can find places to go if you favor spur of the moment getaways over well planned excursions. Exploring travel options is one of the best form of play that adults hold onto. Travelindicator supplies plenty of fun worth indulging in, whether you’re looking for a spiritual retreat, architectural wonderland or another kind of holiday that pumps your blood. For reasons beyond my choosing, I’ll be headed to New Orleans this July – when ALL of the guide books say to stay away. I’ll be turning to travelindicator.com by day 2 for help finding nearby shade.